This very compact stretcher made from easy clean, heavy duty vinyl material can be easily folded for storage in a vehicle or back pack. It offers four webbing handles on each side and two at each end. 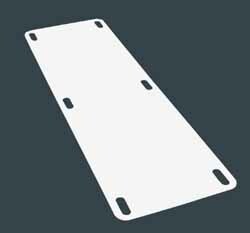 The Carry Sheet is also available as a split sheet that uses an easily removable flat plastic spine down the centre of the sheet. 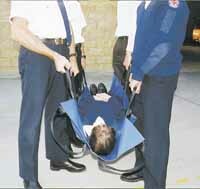 An extremely compact carry chair for use on stairs, confined access spaces and crowded locations. 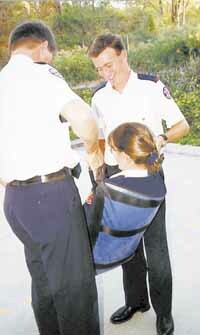 The MUT features webbing handles on the four corners and a lap belt for the patient. Folds to a very compact package for easy storage in a vehicle or back pack. The Simple Slide is made from 4 mm "easy slide" plastic with tapered edges and offers three handholds on each side. 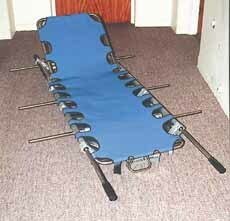 Megalift An extremely heavy duty stretcher for very heavy patients. The Megalift offers three extending handles on each side, extending handles on each end, adjustable height back rest and a removable diaphragm. In combination with the Megalift Split Carry Sheet, this stretcher offers the solution for moving very heavy patients and fits standard floor brackets.